MINGORA, Pakistan (Reuters) - For many of her compatriots, Malala Yousafzai is a stooge of the United States and a CIA agent, a symbol of the West's evils and a global conspiracy to bring down her native Pakistan. She has won the European Union's prestigious human rights award and was one of the favorites to win the Nobel Peace Prize on Friday, but in her native Swat valley, friends and neighbors reacted with a mixture of resentment, fear and jealousy. "Malala is spoiling Pakistan's name around the world," said Mohammad Rizwan, a shop owner in her hometown of Mingora. "We didn't need Malala to come and tell us how important education is." Around the corner from his shop is the quiet street where Malala, 16, was shot a year ago after trying to defy the Taliban with her outspoken views on women's right to education. But in this deeply conservative part of Pakistan, where women are expected to stay at home and keep their views to themselves, many people view Malala's campaign with suspicion. In a nation thriving on conspiracy theories, some have even doubted the sincerity of her campaign, claiming it is part of her family's ploy to move to Britain or that she is just an attention seeker. Social media sites are brimming with insulting messages. 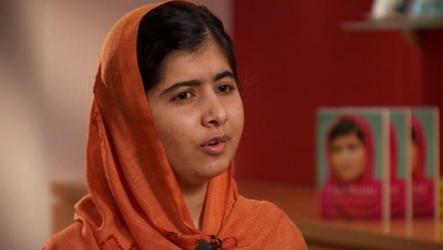 "We hate Malala Yousafzai, a CIA agent," says one Facebook page. "Here, people have been unkind to her. They want to forget her. They think she is a drama queen. But what can you do?" said Ahmad Shah, a childhood friend of Malala's father who helped write her speech at the United Nations this year. "Here in Swat, we have seen the hell that is Taliban rule. And yet, some people still say they would much rather side with the Taliban than Malala. Sometimes people never learn." In an impoverished region where violence is part of daily life, some of Malala's neighbors were simply afraid. Some appeared keen to forget about her and move on. The picturesque valley was overran by the Taliban, who imposed strict Islamic laws and kept its people in fear, in 2007. It is now controlled by the Pakistani army. Mingora, a dusty town of windy roads surrounded by jagged hills, is festooned with billboards reading "Long live the Pakistan Army!" "Malala is a talented girl, no doubt," said Zahid Khan, head of the Swat Peace Jirga, an anti-Taliban body who has survived three attempts on his life for his work. "I have been attacked. Shot. Almost killed. But no one is honoring me. The state hasn't given me a cent in compensation." "She says she does not want to live like an illiterate person in a walled compound and deliver children," said Shahidullah Shahid, a Pakistani Taliban spokesman. "Her mother and grandmother used to live in walled compounds and deliver children, so by saying that she didn't even spare her mother." "We want the girls to forget the trauma of that day," said Nargis Bibi, a school administrator. "We want them to forget it. We don't want them to relive it again. We all want to move on." Quratulain Ali, Malala's friend, said quietly: "We are all very happy in our hearts (that she was nominated to win the Nobel Peace Prize) but we don't often speak about it openly. There could be danger for us also." The award went to the Hague-based Organisation for the Prohibition of Chemical Weapons, which is overseeing the destruction's of Syria's arsenal.